Sustainable development for rural India, in terms of both policy and practice, has been one of the toughest problems to solve for our times. Development Alternatives, a renowned research and action organisation has been creatively engaged in this sector for thirty three years. Through its different non-profit and for-profit social enterprises, the DA Group strives to deliver “socially equitable, environmentally sound and economically scalable development outcomes”. To get a perspective on the role of ‘data’ in developmental problem solving, we spoke to Dr Alka Srivastava and Mayukh Hajra from the Development Alternatives. Across these themes, the Development Alternatives group runs several diverse projects on watershed management, production of eco-friendly Fly-Ash bricks, affordable housing, women’s literacy, community radio, soil quality enhancement, etc. Though they have presence in several countries and Indian states their main project site or ‘karma-bhoomi’ is the Bundelkhand region in Central India. Data is critical to all processes of research, implementation, monitoring and evaluation of grassroots development projects. 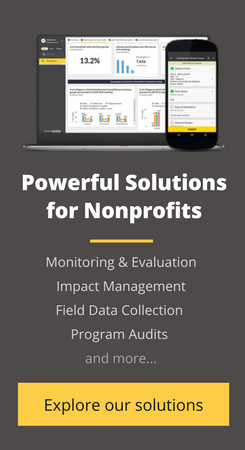 At Development Alternatives, they frame data from projects using a triple bottom line approach of social, economic and environmental assessments. Suppose they have to intervene for proper facilities for WASH (water, sanitation and hygiene) in a village. The project will come under the Basic Needs Fulfilment theme and will be linked to other relevant aspects like health, habitat and livelihoods. These linkages are systematically drawn from both the primary and secondary sources, and are operationalised with the following steps. They collect relevant data to check the need for this intervention. Being a more than three decades old organisation, their first source of data is their own archive and people’s experiences of working on related projects. Secondary data analysis and literature review to build a hypothesis. Contextualize the intervention as per the geographic scope. Check the baseline through field data, which is generated through a dedicated field study or by their local partner organisations. Based on these steps they design their proposal and outline the activities and desired outcomes of their intervention. If the proposal is accepted, depending upon whether it’s a research or implementation project and the longevity of the project, they devise their data collection and management strategies. The reason Data Alternatives uses both primary and secondary data is because they believe these are not two parallel tracks and that the insights from the two sources must converge. Generally, primary data is used to scrutinize and validate the secondary data. And the secondary data helps them formulate the right questions for primary data collection. Normally secondary data is available only up to district or block level, so for their work at the household level they have to correlate between the macro and micro perspectives. Approximately half of the data collected by Data Alternatives is qualitative in nature. They appreciate the fact that at the end of the day they’re working with human beings, whose subjectivities can’t be quantitatively determined. Moving beyond the either/or question of qualitative vs. quantitative data DA tries to capture the ground realities on a project specific basis depending upon the local context. The emphasis on better data management and practices is only increasing with time. Over the last decade, they have been striving to streamline their digital archive which they refer to as a Knowledge Management System (KMS). All project documentation including internal learning documents and project reports now archived in the KMS. They have started using digital tools in some of their projects like TARA Akshar, and a MIS system for farmers. They have also started collecting data from their brick manufacturing machines to monitor the performances of machines which are used by different stakeholders. Moving forward, they think they would adopt more digital tools wherever they are beneficial, without losing out on the humane aspect of their work which is captured by qualitative methods. Data Alternatives’ successful integration of qualitative and quantitative data and macro and micro-level perspectives, informs us about the complexity of grassroots data problems, and the possibilities for developing context sensitive data solutions. This is a part of our ‘Data Ecosystem’ series, an effort to highlight organizations & non-profits leading the curve of evolution towards data-driven decision making.